The Antonio B. 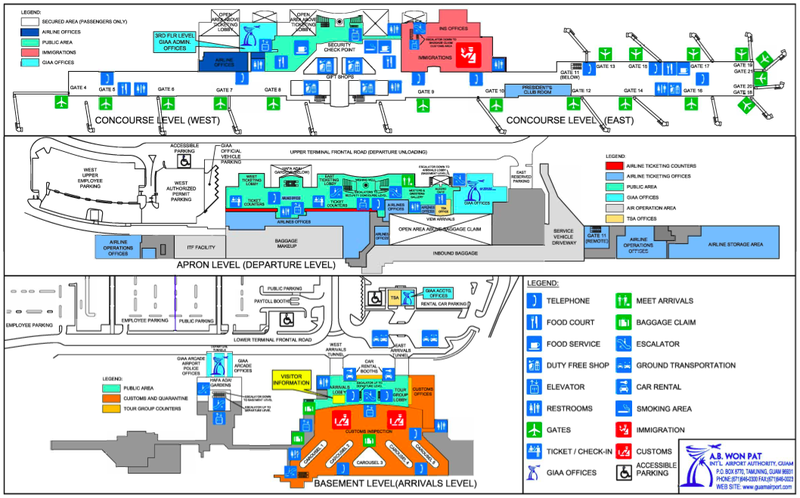 Won Pat Guam International Air Terminal is a spacious tri-level complex located only two miles from Tumon Bay's hotels. With the completion of renovation and expansion in 1998, the airport facility is approximately eight football fields in length. Guam's airport services more than six airlines and four domestic carriers on a daily basis. Up to 3,149 million passengers were transported in 1999. Average flying time from major Asian cities is between three to four hours. Flights are available to the U.S. mainland by way of Hawaii, Japan, Korea, and other Asian countries, as well as the islands throughout the Pacific. The air terminal features car rental agencies, a currency exchange facility, hotel telephones, and a large duty-free shop, as well as a cocktail lounge, restaurant, and coffee shop. Nine food and beverage outlets offer a variety of name-brand food items. Seven locations throughout the terminal showcase local artwork, which was selected through the Guam Council on the Arts & Humanities Agency&apos;s Art in Public Buildings Program. Main Terminal services international arrivals and departures. Parking at the A.B. Won Pat International Airport is conveniently located outside the West Arrival terminal building. Motorists can park on-site for short-term and long-term periods. Public parking is operated by Pac Air Services, Ltd.
Click HERE for rate information.